In the depths of winter it is always nice to dream about lazy summer days in the garden. Many of us like to spend time, in the winter months, planning our garden makeovers. 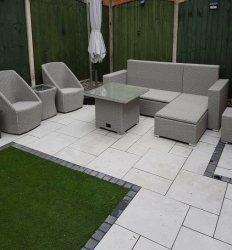 Whatever plans you may have for your garden, Paving Stones Direct can provide the right ingredients to transform your garden into the ultimate outdoor space. As with all things, garden landscaping requires careful planning and preparation in order to avoid potential problems. To start with you need to have an idea of the type of garden you want. Do you prefer a natural look or do you require a more modern, minimalist garden? 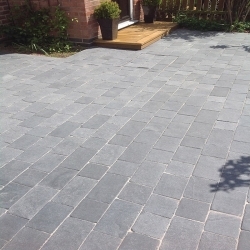 Once again, Paving Stones Direct can provide you with the supplies you need from vitrified porcelain right through to granite, slate or limestone paving. Another question to ask yourself is do you want a low maintenance garden or a garden which requires a more hands on approach? Paving large areas and using artificial turf can help create a garden which requires minimal upkeep. Here at Paving Stones Direct we have a large selection of artificial grasses which can help you achieve a more natural look without the hassle of having to get the lawnmower out. Once you have decided upon the type of garden you want, the next step is to plan the areas you wish to landscape. You need to work with your garden to achieve the very best outcome. Good garden drainage is crucially important as this will allow water to drain away and prevents plants from becoming waterlogged and soggy lawns. Water also needs to be diverted away from your property as it can cause damp issues. There are a few landscaping ideas which can help improve drainage including installing a French drain, a dry well or even a small holding pond depending upon the area where there may be a problem. Solid driveways and paths need to have the correct amount of slope to allow water to run off. Gardens which are on a slope may suffer from soil erosion and retaining walls may be necessary to prevent soil being washed away by heavy rainfall. If your garden is in a windy area you may also need to add windbreaks to your plan to avoid your garden becoming a wind tunnel. It is also worth noting that wind can kill plants. Windbreaks can be made by planting natural hedging, tall shrubs or by the addition of carefully sited walling. Paving Stones Direct have a huge range of natural stone walling as well as wooden sleepers which can help create natural windbreaks or buffers against erosion. You may feel that your garden is in an exposed position offering little in the way of privacy. This problem can be solved by the strategic use of tall shrubs and hedging as well as a more permanent solution using walling. When it comes to planting, care should be taken to site plants in an area where they will be able to thrive. For instance, shade loving plants should be used in a dark corner whereas sun loving plants should be used in areas where there is little natural shade. It is important to think about garden storage at the planning stage as you may well need to set an area aside for a shed to store all your garden equipment from lawnmowers to spades. The creation of walkways around your garden will allow you to use your outdoor area all year round. Here at Paving Stones Direct we have a huge range of paving and stepping stones which can be used to create pleasant walkways around your garden to minimise the wear and tear to your lawn. They can also provide the ideal base for a shed or greenhouse. If your garden is very rocky you may decide to make this into a feature by creating a rock garden using drought resistant plants in the crevices and if you are not fond of weeding you may want to consider adding mulch or bark to your borders as this helps to minimise weeds. You may wish to add an entertaining area to your garden makeover. A place where you can relax and drink a glass of wine with friends or perhaps have a BBQ. Paving Stones Direct stock a large range of stone circle kits - ideal for adding an eye-catching feature to your paved area. Your ideal garden can be achieved with the help of a little careful planning and supplies from Paving Stones Direct and with our easy to follow laying guides and 'how to' videos you will be amazed at how easy it us to achieve a stunning result. As all our paving stones are imported direct from the manufacturers we can pass on huge savings to our customers so your ideal garden makeover may not be as expensive as you might imagine. How much are paving stones?